Nothing sets the tone of a meal like what’s placed on the table upon seating — the humble menu. The table setting, the restaurant decor, the waitstaff, the restaurant’s general ambiance — they’re clues to the dining experience to which the menu is the key. Menu in hand, all of the pieces fall into place. Menus tell a restaurant’s story on paper, an introduction to the chapters that will be devoured on the plates that are yet to come. 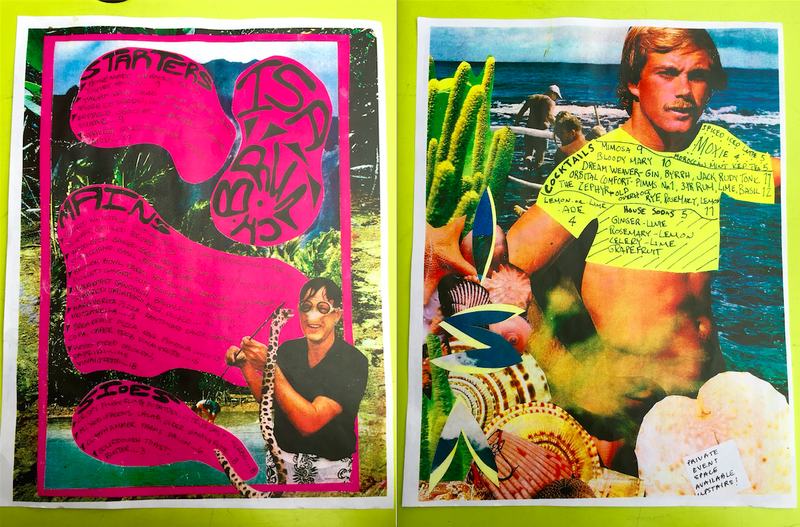 There are menus — and then there is menu art. 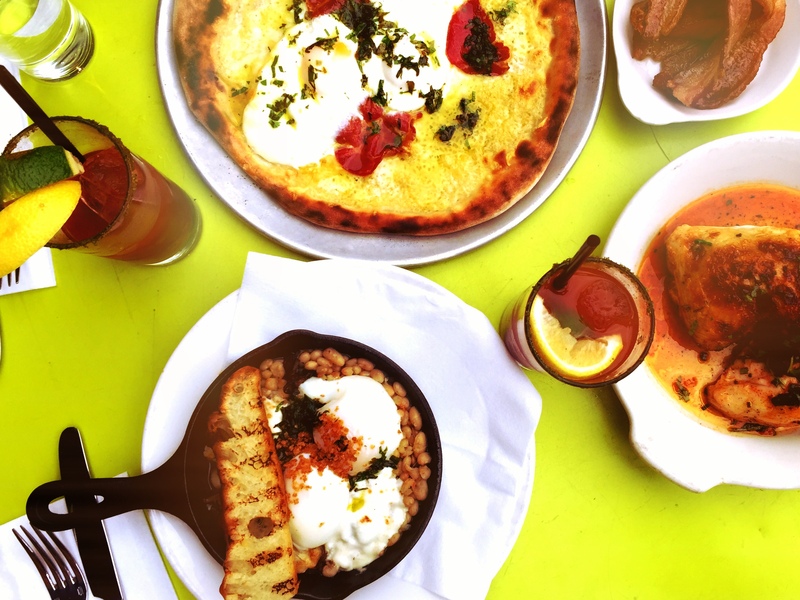 Which brings me to Isa, a laid back, rustic-chic restaurant appropriately located in the heart of Williamsburg, Brooklyn, serving up fresh, loosely “Mediterranean” fare for which the wood burning oven is the through line. Elegant, refined, classy — Isa’s menus are not. But they are by no means an afterthought (one of the worst things a restaurant can do is not give proper consideration to the design of their menu, IMHO). A riotous mashup of color, collage, equal parts whimsy and cheeky, Isa’s menus always elicit a smile (and perhaps an arched eyebrow). Their menus change often and live on for perpetuity on their Tumblr blog. Without a doubt, their current cocktail menu, pictured above right, is one of my all-time favorites. YES, I want whatever he’s having! Let’s hang out and then go catch a wave! Oh, right … it’s November in New York. Brunch at Isa, clockwise from top: Breakfast pizza, Clawhammer Farms bacon, wood-fired chicken, wood-oven baked eggs. The undisputed star of Isa’s brunch menu is their breakfast pizza, which is topped with eggs, Fontina cheese, coppa and a caper herb vinaigrette. Someone at the table has to get it and inevitably shares with the table whatever portion they’re incapable of finishing. And while the brunch menu does feature variations of egg dishes, breakfast sandwiches and other brunch staples, the offerings are overall thoughtful, original, clever and delicious — four adjectives you could also use to describe Isa’s menus. Delicious? A paper menu? I’m not advising you to eat the menu — only to devour with your eyes.